Chris Blackwell recalls, with pinpoint vividness, the moment Bob Marley walked into his London office. It was 1972, and Marley, along with fellow Wailers bandmates Peter Tosh and Bunny (Livingston) Wailer, found themselves stranded after being invited to go to Sweden to do music for a film that had fallen through. The musicians, down and out, had just enough money to get from Stockholm to England. With no way to get home to Jamaica, their ultimate destination, they connected with Blackwell through a friend and requested a meeting. Blackwell, then a 35-year-old budding music and entertainment mogul, was interested, of course, in meeting the young musicians. As the founder of Island Records, which he started at age 22, Blackwell had a huge hand in popularizing Jamaican music that eventually became known as ska. He’d even released some of the Wailers’ early records, including “Bend Down Low,” as well as their first record, “Judge Not,” which was produced by Leslie Kong, in Jamaica. But he’d never met the lads — and didn’t exactly know what to expect. “They all struck me as special,” recalled Blackwell, who was working with Toots and the Maytals, the Jamaican group that brought the word “reggae” to the world with their 1968 single “Do the Reggay.” “I got this call to say they were stranded — yet when they came into my office, they came in a way like princes: They had a strong personality, a strong sense of self. They were impressive. I was immediately enamored with them.” Call it happenstance, or even serendipity, but the meeting couldn’t have come at a better time for Blackwell, and for the Wailers. Blackwell had lost his main Jamaican reggae artist, Jimmy Cliff, who had decided to leave Island Records to sign with EMI just a week before. “At that period and time, I was very involved with rock music and not so involved in the day-to-day Jamaican music anymore,” Blackwell said. The Wailers needed Blackwell, and Blackwell needed the Wailers. The rest, as they say, is history — beautiful, soulful history. A few months after that chance meeting, Blackwell found himself in Jamaica and in a studio with the Wailers, who played him Catch a Fire, their 1973 LP and first album released by Blackwell’s Island Records. It was the start of a lifelong friendship, as Blackwell would co-produce virtually all of Marley’s classic ’70s albums and contribute to his appeal to a worldwide audience. Jamaica was not a good place to be in the ’70s. Not for tourists, not for natives — not for anybody. The island known for its nice vibes and white-sand beaches ran amok with gangs, drugs, violence, corruption and political upheaval. The leaders on both sides, Prime Minister Michael Manley of the People’s National Party (PNP) and Edward Seaga of the rival Jamaica Labor Party (JLP), had little in common — save for disdain for each other. Manley was aggressively opposed by the CIA and American business interests, and by 1974 he was opposed by the more conservative, Harvard-educated Seaga, whose previous life included time as a music producer and promoter. Things came to a head when the two politicians hired local gangsters to help them increase their hold on power. 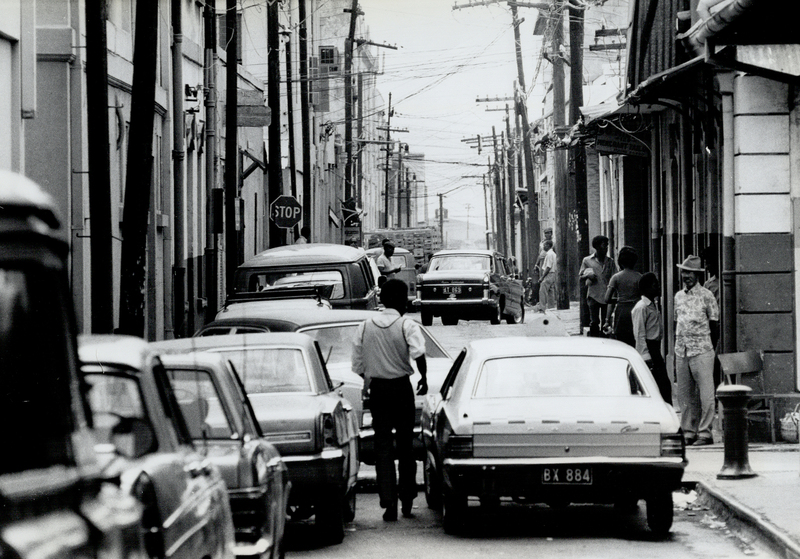 A street view of Kingston , Jamaica, in 1974. Marley found himself in the middle of this concrete jungle when, in 1976, he was almost killed two days before he was to perform at Smile Jamaica, a public concert organized by Manley. A bullet passed through Marley’s elbow; his wife, Rita, had a bullet removed from her head. Marley played the concert but left immediately afterward for two years of self-imposed exile in London and the Bahamas. The need for peace, something the Smile Jamaica show attempted to bring about, stayed on everyone’s mind. Ironically enough, the idea for a proper peace concert would come from two gangsters from rival political factions: Claudius “Claudie” Massop (who repped the JLP) and Aston “Bucky” Marshall (PNP), who jointly decided that the best means to bring the country together was through music. And Marley, it was decided, would be the person to headline the show — and the movement. “I know for sure that the whole idea stemmed from political people who knew Bob, and they all met up on mutual ground in England and said, ‘Let’s do something to bring some peace to the community,’ ” recalled Stephen “Cat” Coore, one of the founding members of the band Third World. “Things had been rough in the community. There had been a lot of political warfare. But that was what the plan was: to have this concert and bring some peace to the community,” continued Coore, who played bass for Marley during Smile Jamaica. With Marley on board, momentum for the One Love Peace Concert grew. Those close to Marley say the musician felt a calling, not even two years after he was almost killed, to be his country’s messenger of peace. He also felt no fear. 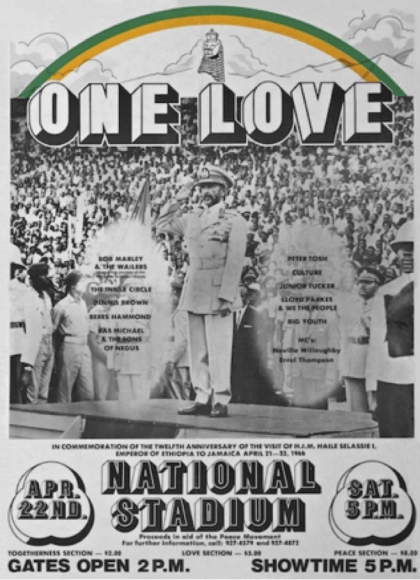 Billed as the “Third World Woodstock,” the One Love Peace Concert — on April 22, 1978 — attracted more than 30,000 people to the National Stadium in Kingston. The performers included rude boy Jacob Miller, Peter Tosh (who, Garrick recalls, berated political leaders sitting directly in front of him for their positions against legalizing marijuana) and, of course, Marley, who took to the stage just after midnight. “The vibe was great, the whole vibe of the concert,” recalled Blackwell, who was in the crowd. “It was really sort of encouraging because the purpose of the concert was to try to get these politicians to work together rather than being at war. You have to remember, the political violence had damaged Jamaica badly — which really sort of started in the early ’70s, and now we’re in 1978 — so it had been going on for seven, eight years. Manley and Seaga were both in attendance — not sitting together, of course, but in the same place, sending a clear message to the country that a coming-together movement had begun. 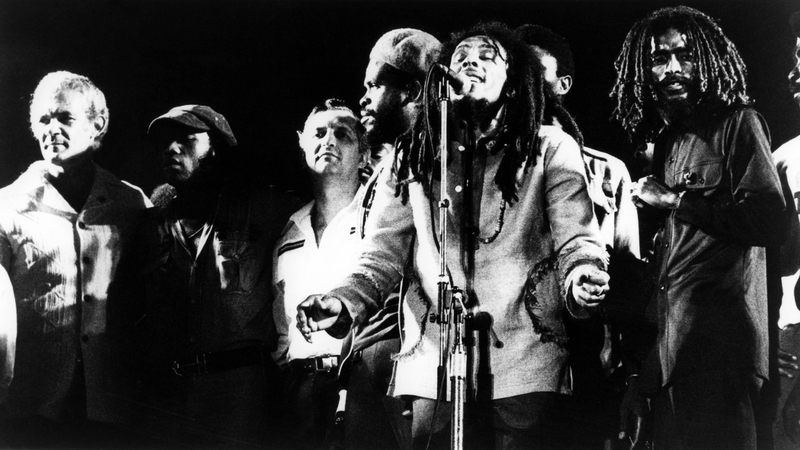 Bob Marley and The Wailers perform while they have Jamaican Prime Minister Michael Manley (far left) and his political opponent Edward Seaga (third from left) on the stage during the One Love Peace Concert in Kingston, Jamaica. Marley performed and didn’t disappoint, singing some of his biggest hits at the time. But it was during his performance of “Jammin’” that the show became something bigger — when Marley brought Manley and Seaga up to the stage in the ultimate gesture of unity. “He called them up, [and] Seaga came up quick,” Garrick recalled. “I think it forced Michael’s hand. Seaga was on stage a good minute and a half before Michael [came up]. One came [from] stage right, the other [from] stage left. The pictures will tell it — the stage was full of people. After that epic concert, there was a period of calm — even somewhat of a truce among warring communities in and around Kingston, including Tivoli Gardens, Arnett Gardens and Trench Town. But a short two and a half years later, in October 1980, Jamaica would have one of its most violent elections. Seaga’s JLP would emerge victorious and the balance of power switched hands. 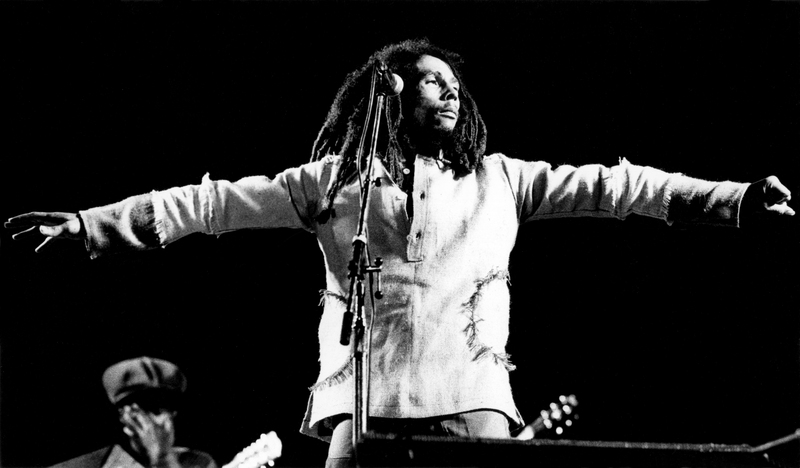 Bob Marley performs during the One Love Peace Concert in Kingston, Jamaica. Some 45 years after Marley, Tosh and Wailer walked into Blackwell’s office with dreams of making an impact on the world with music, a reflective Blackwell finds himself looking back on a life that could have been saved, not needlessly cut short by cancer, at 36 years of age. “The whole thing of Bob passing was just really a tragedy, a disgrace in a sense,” Blackwell lamented. “Nobody, absolutely nobody — from he himself, people close to him, to those who worked with him after that period, including myself — never mentioned anything to him about having regular checkups to see if there were any negative effects from the [soccer] accident he had on his toe. We did know that he was advised to have it amputated, and he didn’t want to do that because he loved soccer — 98 percent as much as he loved music. The thought that if he had his toe cut off he would no longer be able to play soccer in the same way, without the agility with his foot. Marley’s oldest daughter with Rita adds perspective: “You know what, Daddy was pretty strong in wanting to make a difference — not just in his life and his children’s life, but in the world,” said Cedella Marley, 49. “As corny as that might sound, he really believed he could do it. I think now, him seeing what’s happening, I think he should feel very accomplished.